Rodents In Your Crawl Space? Your crawl space is home to many important components of your home such as pipes that run water through it, and cables for electricity! Make sure they’re safe from potential harm with our various cleaning services. If rodents have been present in your crawl space, even if it was a while ago, the waste and otherwise they left behind can still be a danger to your household! Rodent waste can carry hazardous bacteria, and they may also be found in carcasses if any of them died in the area. 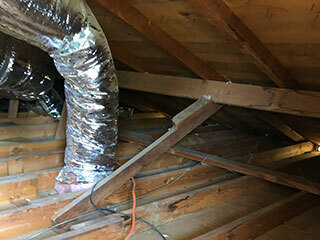 While you may think the crawl space is secluded from the rest of the home, hot air rising can still draw these health risks up into your household. We can help! Our experts will go over the entire area using special sterilizing spray to ensure that there’s no bacteria or otherwise left behind. Aside from decontamination, an overall cleaning is also a good idea after a rodent problem! They likely left a mess of nesting materials, droppings, and other debris that can encourage even more pests into the area if it’s not taken care of. Rather than trying to navigate the tight space yourself, just let our technicians handle everything. We use the finest equipment to get the area completely cleaned out of any unwanted materials. Should rodents still be present in your crawl space, don’t worry! We can help with that before you know it. We trap and remove rodents rather than using harmful chemicals that can be a health risk to pets and even your family, making it the most ethical way to clear your crawl space of any unwanted guests! You’ll be able to rest easy knowing your crawl space is free from potential damage and diseases brought by the rodents, and will remain uncontaminated by chemicals as well. Why Wait When You Can Call? Ensure that your crawl space is safe and clean right away with our affordable services! Just contact Attic Cleaning Glendale today, and we’ll make sure both your attic and crawl space are clean, and rodent free!